Viewing Record 19 of 22 artist: Traub, Charles H.
During the 1970s Charles H. Traub pursued an ongoing series of street photographs in Chicago. In photographs of people on the sidewalks, Traub often shot from a low angle, or with the camera positioned at waist level. Heads or limbs are cut off by the edge of the frame and the photographs imply an incredibly close proximity to the subject, as if we were stepping into his or her personal space. These techniques are particularly pronounced in two of Traub's photographs from 1973 and 1974, in which the subject's body is framed tightly so that a shirt or jacket becomes a nearly abstract field of patterned cloth that spans most of the image. During his years in Chicago, Traub also completed a body of work devoted to the city's beaches. His photographs of men and women on the waterfront are by turns sensual and comical, depicting people lying on the sand, swimming or sunbathing, or showing off for other beach-goers. In these scenes, as with his street photographs, Traub's vantage point is incredibly close to the people he photographs, zeroing in on woman's hip or a man's backside or sprawled legs. The vignetting in these works, a soft black border around the image, can lend the impression of looking through a peephole at something usually kept out of sight. 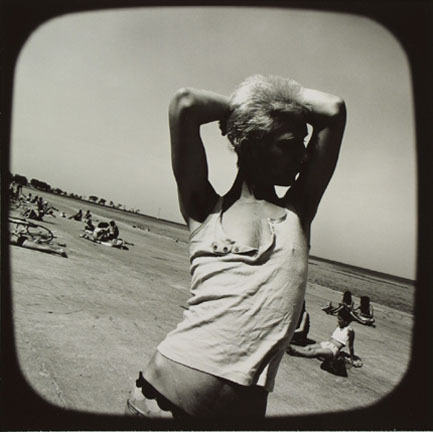 At the same time, Traub's beach pictures are distinctive for their dynamic formal arrangements and off-kilter angles. He tilts the camera so the horizon line becomes an abrupt diagonal cutting through the image, while organizing the figures along more vertical and horizontal axes in front of it. He also staggers the beachgoers from foreground to background, creating a counterpoint between the person at the center of the image and people farther off. A photographer and educator for over thirty years, Charles Traub began his career in Chicago. After completing a BA at the University of Illinois (1967) and an MS in photography at Illinois Institute of Technology (1971), Traub joined the faculty at Chicago's Columbia College, where he taught from 1971 to 1977. In 1976 Traub founded the Chicago Center for Contemporary Photography, the predecessor to the Museum of Contemporary Photography, which was established seven years later. In 1987, having relocated to New York, Traub founded the graduate MFA Program in Photography, Video, and Related Media at the School of Visual Arts, where he has taught ever since.